Beulah Buff Preserve is located at N9026 Bakavi Way, East Troy, WI 53120. The Preserve overlooks the northwest shoreline of Lake Beulah. An overlook allows visitors to enjoy a peaceful view or to observe wildlife using the prairie and oak woodlands. A small parking lot and kiosk is maintained for visitor enjoyment. Kettle Moraine Land Trust purchased this 8 acre property in August, 2012 to protect the restored Bur Oak Prairie. The previous owners of this property, Bill and Kathy Tarman-Ramcheck, envisioned their homestead as a place of peace and beauty that should be forever shared with the community. In partnership with KMLT, the Tarman-Ramcheck’s dream has become reality. Eric Tarman-Ramcheck prepared a restoration plan for his family property and has worked for many years to realize it, recreating the open, native pairie on the bluff overlooking Lake Beulah. He led the removal of non-native species from the existing paririe remnants, performed annual burns on the property and reseeded native plant species. The homestead structures were removed from this site during 2013. An observation deck was built in 2014 for the south facing lawn area to provide a view of Lake Beulah from the Preserve. Volunteer workday events are planned for several times during each year to help KMLT continue to restore and manage this unique preserve. 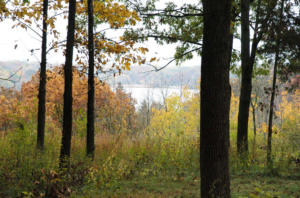 Beulah Bluff Preserve was acquired by KMLT in part with funds from the Wisconsin Department of Natural Resources (WDNR) Knowles-Nelson Stewardship Grant. With the receipt of these funds KMLT is obliged to allow five nature based outdoor activities the WDNR promotes on any state funded properties: hunting, fishing, trapping, cross-country skiing and hiking. There are no lakes or streams on the preserve so fishing is not offered. Due to the small size of the preserve available for hunting, KMLT’s grant was awarded with restrictions on hunting and trapping. These restrictions prohibit gun hunting and allow archery hunting for deer and turkey with a permit. Contact the KMLT office at 262-949-7211 to inquire about an archery permit. The Preserve gate is closed during the winter months however there is space for two cars to park at the gate, and visitors are encouraged to walk or snowshoe into the preserve.